Historical satellite observations have shown a strong greening trend across the arctic, and this trend is important for understanding changes in plant productivity and the carbon balance. The greening of the arctic is often attributed to increased temperature, but arctic plants are more limited by nitrogen than by temperature alone. Kremers’ proposed research seeks to understand the greening trend by examining the links between temperature, nitrogen, and carbon. She will assimilate 20 years of arctic long term ecological research measurements into a coupled carbon and nitrogen cycling model. Kremers will work on this research under the guidance of Adrian Rocha, assistant professor of biological sciences and member of the Environmental Change Initiative. 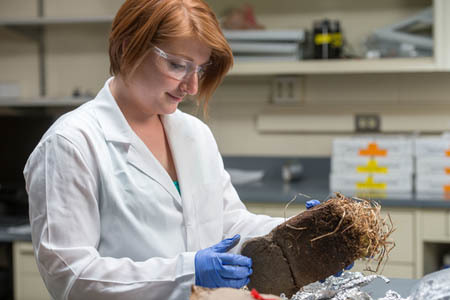 Originally published by Stephanie Healey at science.nd.edu on May 29, 2015.